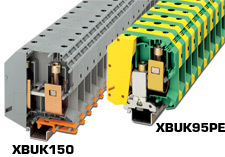 The XBUK high current terminal blocks offer a reliable connection via the superior construction which includes three-point centering of the wire in the prism-shaped sleeve base, a fluted contact surface for low contact resistance, and screws secured with spring-loaded elements. The terminal blocks have an enclosed housing made from polyamide 6.6. Green-yellow ground terminal blocks are also available.